The Department of Psychology and Neuroscience consists of over 50 faculty members, more than 90 graduate students, 2,500-plus undergraduate Psychology majors, and more than 450 Neuroscience majors. Graduate students work closely with their faculty mentors and interact extensively with each other. Interdisciplinary study is encouraged and facilitated by several interdepartmental institutes. 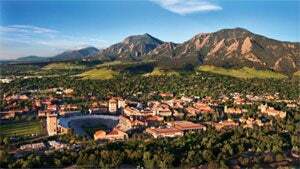 The University of Colorado is an affirmative action, equal opportunity institution. The department encourages applications from minority students and has special programs for their support. The University of Colorado, located in Boulder at the eastern edge of the Rocky Mountains, 25 miles northwest of Denver, has an enrollment of more than 30,000 students. Boulder and the University lie at the center of a vibrant community of nearly 100,000 population. It is a short drive to the 14,000 foot peaks of the Continental Divide; the Boulder campus is within walking distance of the foothills of the Rocky Mountains. The city is protected by the mountains so that its weather in the winter is relatively mild and in the summer sunny and dry. The entrance to Rocky Mountain National Park, downtown Denver, and access to summer and winter recreation areas are all less than one hour away. There are many world-renowned ski areas within a few hours drive. Boulder has become a scientific center for the Rocky Mountain area. Close cooperation exists between the University and the Boulder laboratories of the National Oceanic and Atmospheric Administration (NOAA), the National Institute of Standards and Technology (NIST), the National Center for Atmospheric Research (NCAR), and the National Telecommunications & Information Administration (NTIA). In addition, a number of major companies have located scientific laboratories in the area. Psychology has been a part of CU’s curriculum since the University’s inception in 1876. During the early years, instruction in psychology was linked to the College of Education. The Department of Psychology was established in 1910 but remained connected to Education until 1922 when Lawrence W. Cole began to expand and develop the curriculum into experimental psychology, physiological psychology, and other areas. We can also thank Professor Cole for adding statistics to the major for the first time! Karl F. Muenzinger, for whom our building is named, joined the faculty in 1923. He helped construct the framework of our highly rated graduate program, promoted empirical research and during his tenure as Chair (1947–1953) he encouraged growth and pioneering in all areas. In 1948, Victor Raimy joined the Department and established a PhD program in clinical psychology in only one year. He chaired the conference held in Boulder in the summer of 1949, where the “Boulder Model” was established. This model, now used by most clinical graduate departments around the country, stresses training clinical psychologists as “scientists-practitioners.” Since the 1950s, the department has grown and flourished, performing at the leading edge in the areas of Clinical Psychology, Behavioral Genetics, Behavioral Neuroscience, Social Psychology and Cognitive Psychology, among others. In 2008 the department faculty embraced the growing contribution of neuroscience to our understanding how the brain supports behavior and mental activity by changing its name to the Department of Psychology and Neuroscience. Subsequently, in the fall of 2013, the Board of Regents approved a BA degree in neuroscience, which was developed under the leadership of department faculty. Thus, the faculty in the Department of Psychology and Neuroscience are now responsible for providing undergraduates with degrees in both psychology and neuroscience.